Late summer is the season of opportunity to enjoy the fruits — or vegetables and herbs — of our gardening labours with fresh and colorful salads. 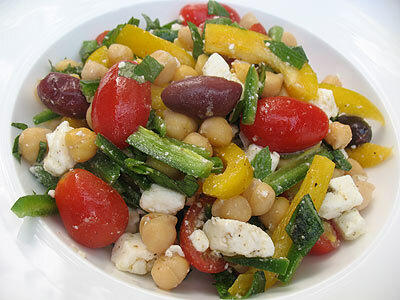 I make my summer chickpea salad quite often at this time of year for the chance to throw in plenty of fresh peppers and herbs from my garden. Zesty and delicious, it's always a popular choice with my husband and friends on the patio table no matter how often I put it together. Rinse the chickpeas and soak overnight covered in several inches of cold water with a little yogurt whey or lemon juice added. Drain and add to a medium saucepan. Cover with fresh cold water or vegetable stock and bring to a boil. Immediately reduce the heat to low, cover, and let simmer for 1 to 1 1/2 hours or until the beans are soft. Drain and set aside to cool for 20 or 30 minutes. 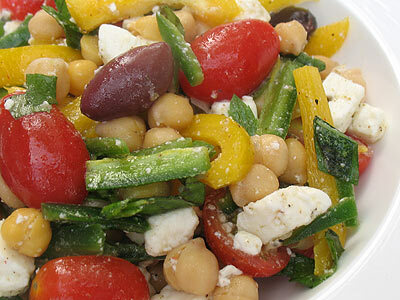 Place the chickpeas, tomatoes, peppers, herbs, Feta cheese and olives in a large salad bowl. Whisk together the dressing, pour over the salad, and gently toss. Serve cooled or at room temperature. Your salad looks so refreshing I can easily see why it would be so refreshing. This looks amazing..everything I love. I grew lots of herbs this year and peppers and some tomatoes. Basil makes excellent pesto and yes, chili peppers and basil are perfect additions to any soup or salad and would qualify for NCR. Looking forward to your entry as always. What a lovely fresh salad that is! That looks fabulous. I think I'll make that tonight. The garden is booming, after all. I will also post a No Croutons entry soon. It is the most delicious time of year!